We are a Fair Trade Verified Locksmith! Locked out of House and Home? Locksmith Ricky Hufford is your man. He recently purchased Wally’s World of Locks, 4939 Carpinteria Ave., and as part of his business model, Hufford will increase store hours from what had been a part time endeavor for retiring Wally Schilling. The company specializes in helping in all issues with locks and keys from lockouts and rekeys to transponder and duplicate keys. Hufford, a jack-of-all-trades, is an Eagle Scout and former trainer of guide dogs for the blind. 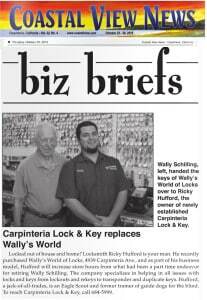 To reach Carpinteria Lock & Key, call 684-5999.